The movement against abortion may be divided into two segments. The larger and better-known is the pro-life movement, of which Secular Pro-Life is a part. The pro-life movement is associated with an incrementalist strategy; pro-lifers are the people behind pregnancy centers, informed consent laws, partial-birth abortion bans, born-alive infant protection acts, and so on. Pro-lifers acknowledge that the pro-Roe Justices of the Supreme Court are not going to suddenly lose their pride, admit their error, and end abortion overnight. Instead, we work to save as many babies as we can in the interim, while the legal eagles of the movement set up challenges to the underpinnings of Roe. People who desire the restoration of the right to life for preborn humans often find inspiration from earlier social movements, particularly the fight against slavery. In both cases, you have a group of human beings who are legally treated as property rather than persons as a result of an unjust Supreme Court decision. I know our pro-choice readers despise the parallel, but it's one of those things that once seen, can't be unseen. But the "abolitionist" segment's embrace of the parallel is far, far stronger. Just check out AHA's Abolitionism Through the Ages page. The history of this image is even more disturbing. The full version includes the title "Stowage of the British Slave Ship 'Brookes' Under the Regulated Slave Trade Act of 1788." What was the Regulated Slave Trade Act, you ask? After the 1788 Regulation Act, the Brookes (also spelled Brooks) was allowed to carry 454 slaves, the approximate number shown in this illustration. 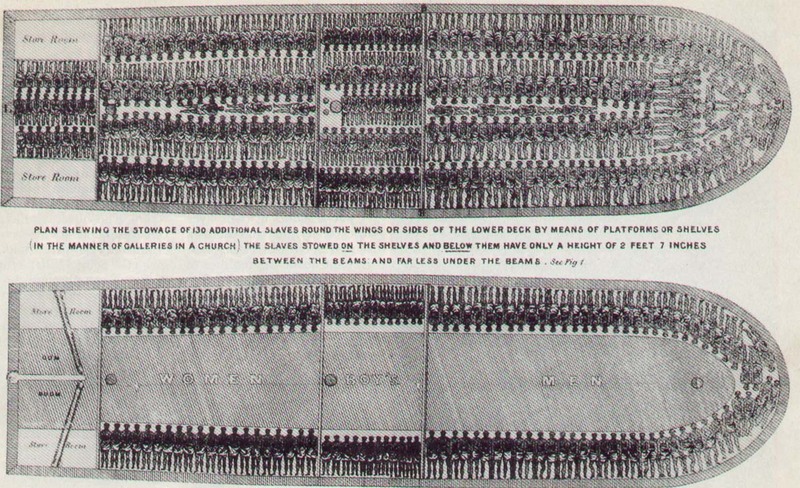 However, in four earlier voyages (1781-86), she carried from 609 to 740 slaves so crowding was much worse than shown here; for example, in her 1782 voyage with 609 enslaved Africans, there were 351 men, 127 women, 90 boys, and 41 girls crammed into its decks. I cannot begin to imagine. Wikipedia notes: "The act was supported by some abolitionists, including Olaudah Equiano, an African who was a former slave. But, some abolitionists, such as William Wilberforce, feared that the act would establish the idea that the slave trade was not fundamentally unjust, but merely an activity that needed further regulation." And so the debate continues. A slaveholder had essentially two methods to obtain more slaves: purchasing slaves shipped directly from their homes in Africa, or relying on the domestic supply of slaves. In 1808, the Act Prohibiting the Importation of Slaves went into effect in the U.S. From that point forward, all new slaves would be descendants of slaves already in the country. Although some international slavers flouted the law, they risked a conviction of piracy that was punishable by the death penalty. The "peculiar institution" continued primarily on the strength of children born into slavery. Unusually, the people formerly owned by Lambeth were advertised for sale as family groups. Louisiana was one of the only states that had laws against selling very young children separately from their mothers—as historian Heather Williams writes, "the vast majority of enslaved children [in the United States] belonged to people who had complete discretion to sell them or give them away at will." What to make of these incrementalist measures? Was Wilberforce right to worry that regulation would undermine the effort to wake people up to the underlying evil? I am not a historian. The events leading up to the Civil War are obviously more than this humble blog post can handle. We can never know the what-ifs; whether the War, and at its conclusion the abolition of slavery, would have come sooner, or later, in the absence of incremental legislation. I can only tell you how I would have voted on these measures if I had been a legislator in the era of slavery. On the slave ship regulation, I would have fought for an amendment to do more, but it would be hard to justify a "no" vote that would maintain the status quo of people literally laying on top of one another for weeks at a time. The other two are no-brainers: I absolutely would have voted to end the horrors of the Middle Passage, even though it did not address the horrors of continuing domestic slavery, and I absolutely would have voted to prohibit slaveholders from ripping families apart. Anything else would have been a complete abdication of moral duty. But I don't expect these examples will get AHA members to change their minds. If you take only one lesson from this post, let it be this: every movement for social change has its factions. It's common and completely understandable for pro-lifers to get frustrated over disunity. I do it too. A lot. But let's not kid ourselves into thinking this problem is unique to abortion. We're not special. There will always be disagreement about tactics. We can—we must—succeed anyway. 39 Years. Over a Million Medicaid Kids Saved. Dear Bill Nye: Where's the science, guy?